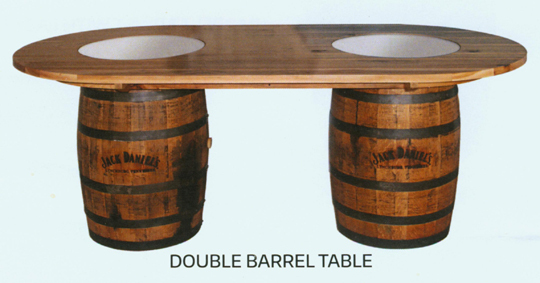 The double barrel table is basically a longer version of our hickory rustic barrel table, featuring two genuine Jack Daniel’s whiskey barrels made into a family size! Because there are two barrels there are also two of the standard recessed tempered glass inlays so you can see the top of the drums. As with the other whiskey barrel tables the Amish furniture provider also has some other options that can go in those spaces, such as lazy susans, etc. The other nice thing about the double barrel table is that because it is longer and more stable you have some other customization options such as what length and width you choose, and more than likely whether you want hickory, oak or cherry for the top. Just give Roger a shout and let him know how you would like it build and he will be able to get back to you with a price quote! You will be able to pick and choose from any of the Amish made whiskey barrel chairs that you have seen with the other tables, or any of our other Amish chairs and accessories that will meet your needs.